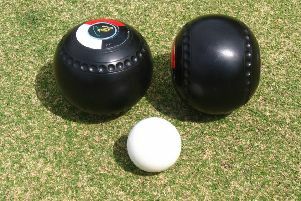 It’s round 12 of 14 tonight in Division 1 of The Alpha Trophies-sponsored Edinburgh Bowling League and two-in-row defending champions Craigentinny are breathing down the neck of long-time frontrunners Parkside. Parkside’s half-point lead puts them under immense pressure to deliver big results in the run-in, starting at home to foot-of-the table Leith this evening. Leith – last season’s Division 2 champions – are destined for relegation but showed a glimmer of improved form in last week’s 7-2 win over Maitland and even a win on one of their four rinks would do damage to the Parkside cause. Craigentinny’s reputation as strong finishers was enhanced by last week’s 9-0 win away to Summerside and the record seven-times champions will be itching for a repeat of that with home advantage over Hillside, who are sitting safe third from bottom, a massive 16-and-a-half points clear of Leith. Queensberry are having a great season and well worthy of their lofty position as third-placed challengers but, with six points between them and Craigentinny, their prospect of breaking up the top two are not bright. However, they could raise eyebrows and expectations if they show a killer instinct to bag maximum points at home to relegation-doomed Summerside and can’t be written off quite yet as legitimate outside challengers for the title. Maitland host Northern in tonight’s other tie. The action in Division 2 will test the promotion hopes of Pilrig. They travel to second-placed Postal with victory a must as they bid to make it back to the level where they feel they belong. Postal are enjoying a serious tilt at making it into Division 1 for the first time and will be inspired by the knowledge that adding to their current three-point advantage over their fourth-placed visitors would be a massive result. Goldenacre also have a big say in who will join leaders Tanfield in the top two but, having weakened into third place by losing at home to relegation-zoned Mayfield, their visit to Wardie looks fraught with danger. Mayfield are at home to Willowbrae in a foot-of-the-table battle with whatever outcome offering little hope of escape to either.